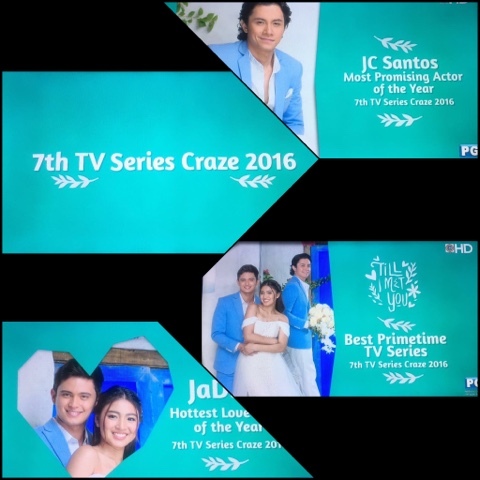 ABS-CBN Features The 7TH TV Series Craze Awards 2016 in "Till I Met You"
The Kapamilya network ABS-CBN recognized and accredit our very own The 7TH TV Series Craze Awards 2016. It was featured in their recently concluded JaDine teleserye "Till I Met You." 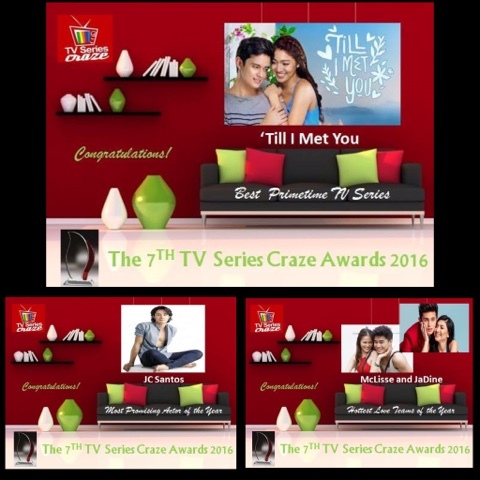 In every commercial break of the said series, they plugged a congratory VTR thanking our awards since "Till I Met You" bagged the most number of awards including the Best Primetime TV Series. Best Primetime TV Series, JaDine as one of the Hottest Love Teams of the Year, and Most Promising Actor of the Year for JC Santos who played as the closeted gay third party to James Reid and Nadine Lustre were the awards received by 'Till I Met You."